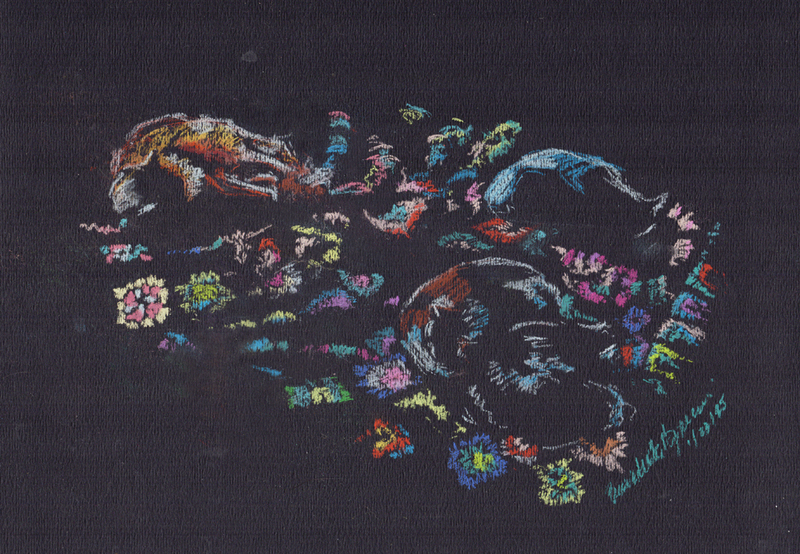 Look closely and you’ll see four cats in this sketch. Smokie, Bella, Bean and Mewsette spent the entire long, quiet afternoon on the wool afghan. The light caught each of their coats in different tones and textures: Smokie at the top left is very mocha, and in the top right Bella is only shades of blue, while Bean and Mewsette, tucked up against each other and facing opposite directions, are combinations of both colors. UPDATE: By request I’ve added this original sketch and prints to my Etsy shop! This sketch is 9.5″ wide x 6.5″ high pastel pencils on black pastel paper, I don’t have it framed yet but wanted to get the sketch up fast because it was popular; I prefer to wait until I’ve gotten a giclee and canvas print to be certain the prints are good before I close a print up in a frame. Here is what I have prepared for the framing: mats 1.5″ wide, deep blue black core top and and Chinese red black core 1/4″ bottom mat. The frame is 1.5″ matte-finish black painted wood with premium clear glass, the backing is acid-free foam core. Finished frame size is 12,5″ x 9.5″. All framing is done by me in my studio. We’re sharing this on “Inspire Me Monday” on “Create With Joy”.